PRE-SCRIPT: If you’ve already read this, please forgive me the re-post. I posted it on Creative Sweet, the GSU Department of Writing and Linguistics’ Creative Writing blog, but I’ve been thinking and re-thinking through it ever since and wanted to post it here, as well. Tonight, on All Soul’s Day, when the time lost its footing and the darkness came on early, just felt like the right time. In my poetry workshop, we started this semester by talking, as we always do, about what poetry does for us as human beings — and how and why it does it. We talked about how poetry works in small, beautiful, and reflective moments that reflect back upon our lives and ourselves, helping us to understand who we are and who we have been, helping us to remember. A poem compresses a moment in time into a substance, diamond-like, that lasts as long as people can read. This idea, of course, is not my own. It’s one of the most ancient ideas we have about poetry, an idea that poets from Sappho to Keats to Dickinson have set into the intricate setting of their language. It’s an idea I am most familiar with from Shakespeare’s sonnets, and as I talked with my class, my mind is turned, as my mind has been turning all semester, to the teacher who led me to understand the sonnet, who spoke so eloquently about poetry, about how it fails and succeeds and fails again at showing us who we are and who we fail to be. That teacher was Diann Blakely. I was seventeen when I took her class at the Sewanee Young Writers’ Conference, where I had showed up with my Nirvana CDs and teenage angst, hoping to find the answer to the question that shouted continuously in the back of my mind: what on earth am I going to do with the rest of my life? In Diann’s class, I got my answer. A few weeks ago, I opened up my inbox to an announcement I had long dreaded but nonetheless never quite prepared for: Diann had passed away. I received the news too late to attend her memorial service, and so I figured I would take this opportunity, in this digital space where the line between teacher and student is blurred, where we are all just writers working to find the best way for our words to say what we need to say, to memorialize her. I began writing this by using dictation software, which changed “memorialize” to “memorial realize.” her. This feels fitting: when we memorialize well, we realize not only what we have lost but what we had. We walk beyond a recitation of our own pain and into the field of celebration of the person as a real human being, with all of the beautiful and terrible attributes that human beings share. We allow the dead to live not just as a memory but as the people that they were. 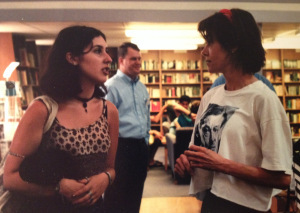 A photograph of Diann and I, posed so as to appear in deep conversation, from 1998. This is what I remember when I remember Diann. I remember her oversize T-shirts, one printed with Courtney Loves’ tiara-topped face, one with a portrait of T.S. Eliot. I remember her holding conferences while she finished her 30 minutes on an exercycle. I remember that I had never really seen the city of Birmingham, the city I called home, the city I drove into and out of every day for high school, until she described it as a “Dantescan pit.” I remember that her very first assignment required us to write a sonnet for which she had provided the end-words. I remember that one of those end-words was “bolster.” I remember her pronouncing, clearly and unapologetically, every single word in Philip Larkin’s “This Be the Verse.” I remember the way she pronounced the word “Harvard,” without any Rs. I remember the white lace shirt she found at an antique store, how she only posed for photographs in profile, preferably in conversation, in a construction meant to imply the candid; otherwise, the camera could take her soul. I remember riding in the passenger seat of her car up and down and up the difficult curves and turns of the Sewanee, and I remember telling her about the plans I had made for myself and my future. I was going to try to do this very difficult thing. I was going to try to be a writer. And in that car, she gave me the confidence I needed to believe that maybe I actually might be able to do this, someday, and that I was at least doing the best thing I could do for myself and for my work, which was to try. And this is the moment when perspective enters, which might explain why the faults of the dead die with them, because the living see these harsh moments as just that, a moment, one small moment in the middle of a life that is over, for all of us, far too soon. In that moment, her comment shattered me. It continued to shatter me for several moments to come. But eventually, I realized that the lack of a gentle presentation didn’t make her words any less true. They were just a bunch of images, ones that I could no longer find pretty, because I knew for sure that she was right. There was nothing behind them. 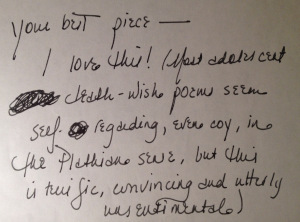 And this is perhaps the most important thing that I learned from Diann: that we as writers and as human beings must continue striving, all of our lives, to make every part of our lives — every word, every letter, every capitalization and every punctuation mark — have a real and true meaning. You’ve listened long enough. Now strike your note. ← Geography V Now Available for Pre-Order!